You should have a general knowledge of working with Microsoft Windows and of basic database terminology. No past experience with SQL Server is required. 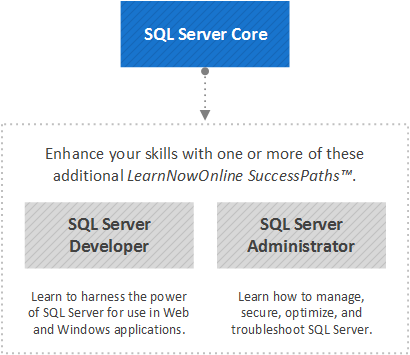 This path covers the core functions and features of SQL Server and is designed for someone with no SQL Server experience. You will begin by learning about the basic installation and configuration of SQL Server. You will explore the Microsoft SQL Management Studio, the tool used by both administrators and developers to control most of the core features in SQL Server. With this tool you will see how to create databases and tables based on sound design principles. You will then be introduced to constraints, triggers, and indexes. You will learn the basics of security so you can set up users and configure the necessary access rights to protect your data. You will explore the core syntax of the Transact-SQL (or T-SQL) language so you can add, view, update, and configure data within your tables. You will also learn basic sorting, grouping and filtering of data.